CHIMO – During the last week of this March, a group of American volunteers is traveling to Chimo, a small fishing village west of Puerto Vallarta, to lead a community mural project. Working with school children from the Chimo primary school, the volunteers will create four colorful outdoor murals that depict and celebrate the rich animal and plant life of the Pacific Ocean, including sea turtles, humpback whales, dolphins, manta rays, fish, and other sea life. The project was initiated by Robb Stasyshyn, a part-time resident of Los Chonchos and his daughter, Phaedra Stasyshyn, who is a resident of Saratoga Springs, New York. Through Phaedra’s friendship with muralist Susan Shanley, the idea of undertaking a mural project in Chimo evolved. “Our international mural projects began in 2009, when a small group of volunteers collaborated with the non-profit organization Esperanza del Norte to create a mural with young people in a village in El Salvador. 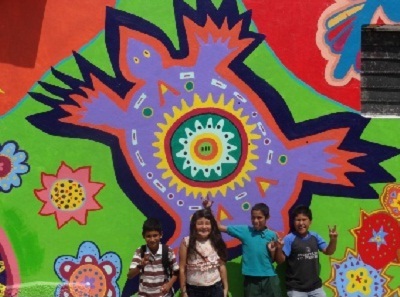 In 2010, we joined OneWorld Classrooms and traveled to Ecuador to create a mural with kids there and, in 2011, we collaborated with the Tepehua Centro Comunitario in the Lake Chapala region,” said Shanley. “The mural projects celebrate the rich ecological life in and around the community where the murals are created. They remind us of how much we rely on these plants and animals and how much richness they bring to our daily lives. We also use local cultural symbols and patterns in the murals as a way of celebrating the region’s cultural heritage. The kids are so full of energy and creativity!” she said. At the Chimo school, the group will work with teachers Edgar Enrique Dia Montoyo and Marcela Rodri. The project volunteers come from New York and Michigan and all pay for their own travel expenses. “We’re in it for the inspiration, the fun, and the feeling we get from making a difference in people’s lives,” said Shanley. The group is looking for local volunteers to help with the project. For more information about volunteering and how you can help, contact Susan Shanley at: sus.shanley@gmail.com.